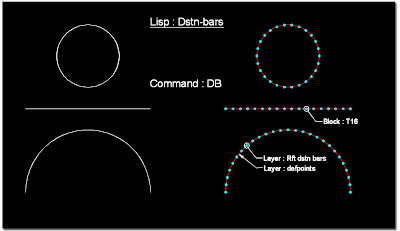 Distn-bars Lisp is used to create Distribution bars in drawing with equal spacing. It will create new block “T16” and be placed in a new layer “Rft dstn bars” .The selected reference object will be placed under “defpoints”. Then select the objects, the result is that the distribution bars will place automatically with an equal mentioned distance. 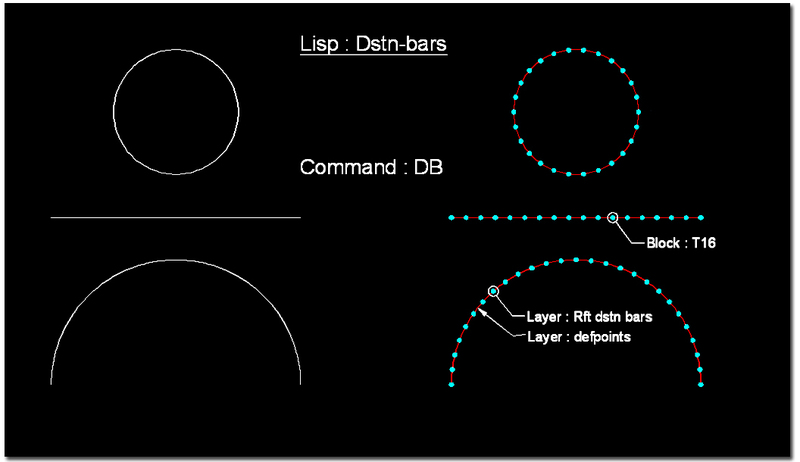 I want a lisp for make car numbering within a circle and only number. I get that from incremental number lisp. But now I want this no in a link also. so, if I delete a car parking, then automatically all nos will reset with this. Like, if i delete 6no. car parking, then next 7no car parking will be 6 and more on. as well as if I add a car parking then rest off all will be change accordingly.